← JERRY ROBERTS. A Win-Win Weekend for the Liberals. ALAN BOYD. Asia’s millionaires leaving for safe havens, lower taxes. Report says thousands of wealthy citizens are leaving Asia and the Middle East, mostly heading for new lives in Australasia, North America and Europe. Asia’s millionaires are packing their bags and moving out by the thousands, lured to new homes abroad by safer lifestyles, better economic opportunities, and in some cases, lower tax burdens. The 2018 Global Wealth Migration Review revealed that China lost 10,000 High Net Worth Individuals (HNWIs) in 2017, India 7,000 and Turkey 6,000. Indonesia (2,000) and Saudi Arabia (1,000) also had net outflows. The study notes a clear upward trend in the numbers of super-rich departees: 6,000 Indians moved away in 2016 and 4,000 in 2015, despite their home nation’s growing affluence. Compiled annually by New World Wealth, the report classifies an “HNWI” as someone with net assets of at least US$1 million, including billionaires and multi-millionaires (who have net assets of US$10 million or more). Affluent Chinese are mostly moving to Australia, Canada and the United States; Indians favor the same destinations, as well as the United Arab Emirates (UAE) and New Zealand. Turkey’s rich prefer the UAE and Europe, Indonesians commonly opt for Singapore and Saudis tend to go to the United Kingdom and UAE. Australia was the most popular destination for itinerant wealthy individuals in 2017, with 10,000 taking up residence there. As well as many Chinese and Indians, Australia also attracted large numbers from the United Kingdom, which lost 5,000 HNWIs. The US (9,000), Canada (5,000) and the UAE (5,000) were other favored destinations. There are about 15.2 million high-net-worth individuals in the world, five million of whom live in the US. Japan is second with 1.3 million, China has 877,700, the United Kingdom 836,900 and Germany 813,300. The other countries in the top 10 for the super-rich are Switzerland, Australia, Canada, India and France. In 2017 there were estimated to be 584,000 multi-millionaires and 2,252 billionaires. The US had 221,580 multi-millionaires, China 40,930, the UK 26,130, Japan 25,470 and Germany 25,070. Billionaires lived in the US (737), China (249), India (119), the UK (103), Germany (82) and Russia (79). “For instance, if a country is losing a large number of HNWIs to migration, it is probably due to serious problems in that country (i.e. crime, lack of business opportunities, religious tensions etc). “Conversely, countries that attract HNWIs tend to be very healthy and normally have low crime rates, good schools and good business opportunities,” the report noted. 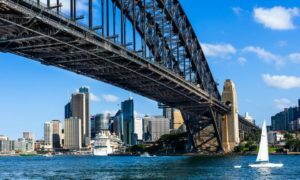 Lifestyle and opportunity appear to be key draws for millionaires seeking greener pastures, and recently have given Australia an edge over the US. The US has now been pushed into second place for three consecutive years. “Australia’s location makes it a better base for doing business in emerging Asian countries such as China, Japan, South Korea, Hong Kong, Singapore and Vietnam,” the report stated. It is also easier to pass on wealth: unlike the US, which levies a 40% tax on estates, Australia has no inheritance taxes. The US rate is the fourth-highest behind Japan (55%), South Korea (50%) and France (45%). Safety is another big reason cited by wealthy individuals for moving to Australia, especially if they have a family. Australia was rated the safest country worldwide in 2017 for women, who strongly influence domicile decisions, and is consistently ranked one of the top 10 countries for raising children. New World Wealth predicted that the Asia 7 — China, Japan, India, Australia, South Korea, Russia and New Zealand — will begin to dominate wealth markets over the next decade as they cement an economic alliance that will eventually surpass that of Western Europe. China’s wealth market is expected to surge by 180% to US$69.4 trillion by 2027, with Japan reaching $25.3 trillion (30% growth), India $24.7 trillion (200%), Australia $10.4 trillion (70%), South Korea $4.0 trillion (40%), Russia $2.7 trillion (80%) and New Zealand $1.3 trillion (a rise of 70%). This article was published by the Asia Times on the 26th of June 2018. It was written by Alan Boyd. 2 Responses to ALAN BOYD. Asia’s millionaires leaving for safe havens, lower taxes. Another article (ie set of observations) which should make it into the mainstream Australian media. Interesting article. If the cut in top tax rates lasts then Australia will have even more appeal to the wealthy. I wonder if Turnbull and Co thought of that?